Medical personnel tend to a victim outside of Marjory Stoneman Douglas High School in Parkland, Fla. after reports of an active shooter on Wednesday, Feb. 14, 2018. At least 17 people were shot and killed in the attack. Las Vegas, Oct. 1, 2017 – A heavily-armed gunman, 64, shoots from his hotel room on the Las Vegas Strip, killing 58 people and injuring 851 others during a night-time, outdoor music festival. He reportedly kills himself. 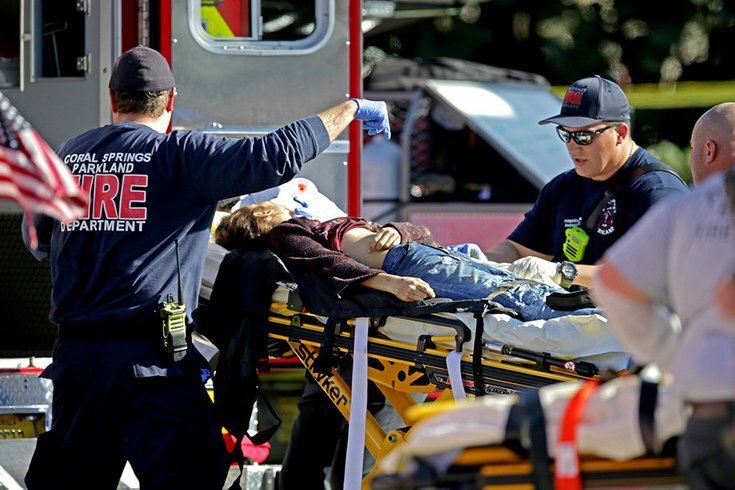 It is the deadliest mass shooting in modern U.S. history. Orlando, June 12, 2016 – A 29-year-old gunman kills 49 people and wounding 58 others at the Pulse gay dance club in Orlando, Florida, in a terrorist attack/hate crime before he is killed by police. Virginia Tech, April 16, 2007 – A 23-year-old gunman slaughters 32 people at Virginia Tech, a university in Blacksburg, Virginia, then kills himself. Sutherland Springs, Nov. 5, 2017 – A former U.S. Air Force soldier enters a South Texas Baptist church and opens fire with an assault rifle – killing 26 churchgoers and wounding 20 others. He is shot twice by a local resident and is found in his SUV after a short chase with a self-inflicted gunshot to the head. Sandy Hook, Dec. 14, 2012 – A 20-year-old gunman kills 26 people – 20 children and six adults – at Sandy Hook Elementary School in Newtown, Connecticut. He then kills himself. Luby’s Cafeteria Shooting, Oct. 16, 1991 — A 35-year-old man slams his truck into a Killeen, Texas restaurant and starts shooting. He killed 23 people and wounded 20 more before killing himself. McDonald’s Massacre, July 18, 1984 — A 41-year-old man enters a McDonald's restaurant in the San Ysidro neighborhood of San Diego and opens fired, killing 21 people and wounding 19 others. He was killed by a police sniper. Parkland, Florida, Feb. 14, 2018 – A 19-year-old former student pulls a fire alarm at the end of the school day at Marjory Stoneman Douglas High School in Parkland, a suburb of Fort Lauderdale, and starts shooting. Equipped with an AR-15 assault rifle, multiple magazines, a gas mask and smoke grenades, he kills 17 people and wounds 17 others. University of Texas Tower Shooting, Aug. 1, 1966 — A U.S. Marine sniper climbs a tower at the University of Texas and begins to shoot at students. He kills 14 people and wounds at least 30. Earlier in the day, he killed his wife and mother. He was killed by police. San Bernardino, Dec. 14, 2015 – A radicalized married couple kills 14 people and wounds 22 others at the Inland Regional Center in San Bernardino, Calif. Police subsequently kill the couple in a shootout. U.S. Postal Service Massacre, Aug. 20, 1986 — A postal employee kills 14 of his co-workers at his Edmond, Oklahoma office before he kills himself at the desk of a supervisor. Six others were wounded.